We will discuss only financial leasing. The difference between the two being that operating lease is not a means of financing equipment purchase – only short-term use of equipment: e.g., car rentals. Maintenance and obsolences risk lie with the leasing company as against the lessee in financial leasing. Why Has leasing grown so fast? Beneficial to both lessee and lessor. Fewer requirements about balance sheets. Governments allow lessees to deduct full lease payments from their income before tax. Lighter regulations, because they are not deposit taking institutions. Tax incentives, although they are eroding. Better control on utilization of funds. Impact on Capital Markets: As leasing firms grow, their needs for diversified funding sources becomes eminent – leading to the use of securitization, issuances of bonds and other capital instruments. Increased Competition: The entry of leasing firms in financing the MSME has encouraged competition in many markets, whereby some of the banks started to go down-market in order to serve the smaller clients. 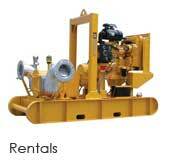 At MWI, we know that pumping equipment can be a significant investment. Time to buy does not always go hand in hand with your needs. Our leasing program can allow you to acquire the pumps you need when you need them – without forsaking your total budget at one time. Payments made by lease program participants are considered operating expenses and not capital expenditures, so they can be written off immediately. This often accelerates tax deductions when compared to depreciating assets over five to seven years. Payments made over a long period of time – e.g. quarterly, six monthly, yearly, according to what is stated in the contract. The leaser can Lease approximately four or five pump stations at once rather than buying only one pump station. Leaser has the option of purchasing the pump station at the end of the contract, at a price agreed upon in the contract. MWI Egypt will always have any spear parts required for the pump station (which saves the Leaser of going through the process of importing any spear parts, which saves time and cuts costs. Lease program participants are considered operating expenses and not capital expenditures, so payments can be written off immediately. 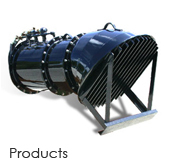 1- Hydraflo – hydraulically driven axial and mixed flow pumps, 8`` to 60``. 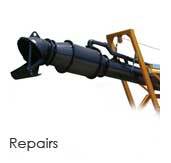 2- Duraflo – hydraulically driven submersible trash pumps, 4`` to 12``. 3- Rotoflo – well point de – watering pumps, 6`` to 12``. 4- Primerite – automatic self-priming pumps, 4`` to 12``. 5- Jet Pump System – high pressure jet pump system, 2`` to 8``.